Many private users and businesses want to expand their audience in the shortest time possible and Instagram bots are the most effective tool for that. We recently posted a reviews of Instagram bots. In that article, you can also read about the pros and cons of using this kind of software. 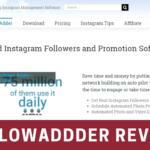 We recommended using FollowAdder as the most efficient and secure Instagram bot. In today’s article, we offer a detailed review and tutorial on how to use this great instrument. This is the best, the most reliable, and the most secure software to automate Instagram marketing. It will automate the process of attracting real Instagram followers, likes, and comments. Using the simple, user-friendly interface, you will be able to completely manage your account. Unlike most of its competitors, FollowAdder supplies real results without putting your account in danger. Using it, lots of manual work will not be required. Increase your website or blog traffic using your Instagram account. Attract new potential customers for your business. Use Instagram marketing to promote your products online. Create brand awareness for company, website or product via Instagram. Earn money using your Instagram account. 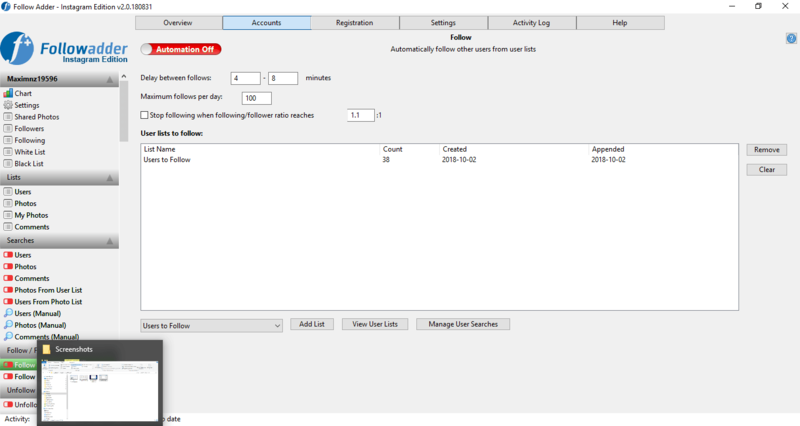 Automate Instagram account management to improve the workflow and get more free time for more useful activities. Having reviewed the usage cases, let’s dive into the features. One of the best features is creating the lists. This will help to work in the niche and select a more specific target audience you are interested to be followed by. What are the lists you can create? Add the users you are looking for to follow or send a direct message. Make a list of photos you would like to comment or like. Create the list of your photos. Later, you will be able to use them, to share them with other users, send them in a direct message, and share them as a thank you message. The list of comments you are going to leave on other photos. Another important thing is the ability to follow, unfollow or follow back other users. Moreover, you are able to unfollow the users from a list or configure it to follow anyone who follows your account. Why is that so important? To follow other people is the most effective way to add more followers to your Instagram account. In most cases, when you follow someone, the users also follow you in return. It will be even more effective if you follow the people in your target niche. This feature will let you scrape other accounts to attract and follow more users. You can set up more parameters to improve the search results. This is useful for discovering and finding great accounts. In addition, it allows understanding your competitors. 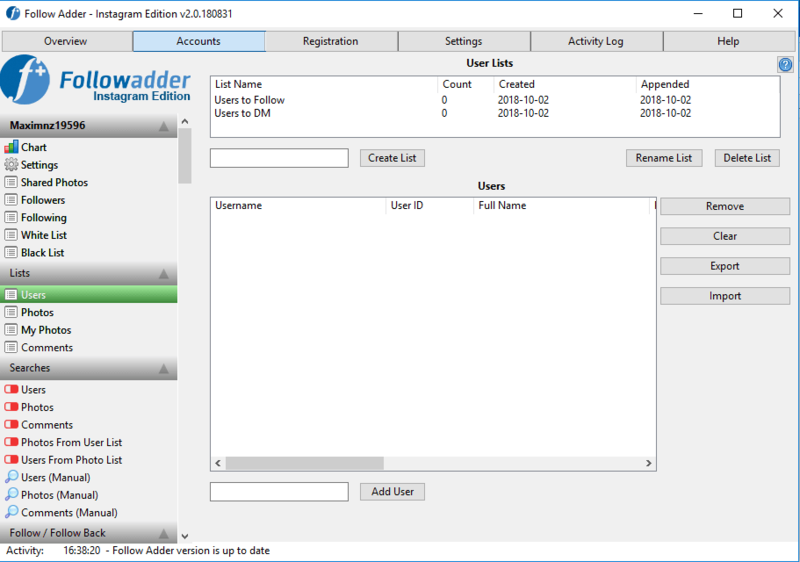 When you generate a list, you are able to use it to follow users. If you are not interested in them anymore, you can just unfollow them in one click. You are also able to follow back the users that followed you first. You are able to upload many pictures to your Instagram account with just a few clicks, saving you a lot of your valuable time. In most cases, uploading new pictures is a monotonous work. One or two pictures are one thing, but when there are dozens or hundreds of them, it will take hours every day. Why not spend this time on more useful things? Use the FollowAdder bulk uploader to automate the process. It will make your working day more effective and will show your followers that you are an active person. Just try this feature! Some users may consider that sending direct messages to users or potential followers on Instagram is not the best idea. At the same time, it can be a great instrument to communicate with active or potential users. For some users, this feature will not be very effective. However, try to use it and you will see if it really helps you. First, send a direct message to the users from the list you previously created. How will these messages be useful? They create a great chance to promote a product or service. Also, direct messages are the best way to tell your followers or potential customers about yourself. Moreover, they really help to develop your personal brand. Hashtags allow following specific trends in Instagram. This social media channel introduced this feature quite recently, but it became very popular in a short time. You can choose a hashtag related to your business niche and follow all the latest trends. Under the hashtag, you will see the posts, pictures, and all the related content. Following a hashtag helps you to choose good accounts to follow and be followed back by their owners. By using this feature, a lot of Instagram users will be interested in your account. If it is relevant to their interests, they will definitely follow you. It’s right what you need, isn’t it? For effective Instagram marketing, you should use FollowAdder in the right way. So, let’s look into more details. Download the application from the official website. It is available for Windows, Mac, and Linux computers. Install the app, following all the wizard commands. Usually, it takes several minutes to complete. On the website, create an account. You will get a registration code in your email. 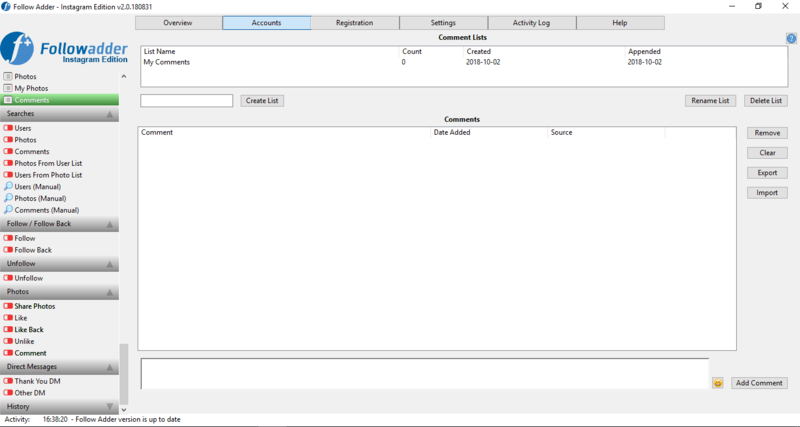 In the application window, add the registration code into the indicated field. This will allow you to use the software according to your plan limits. 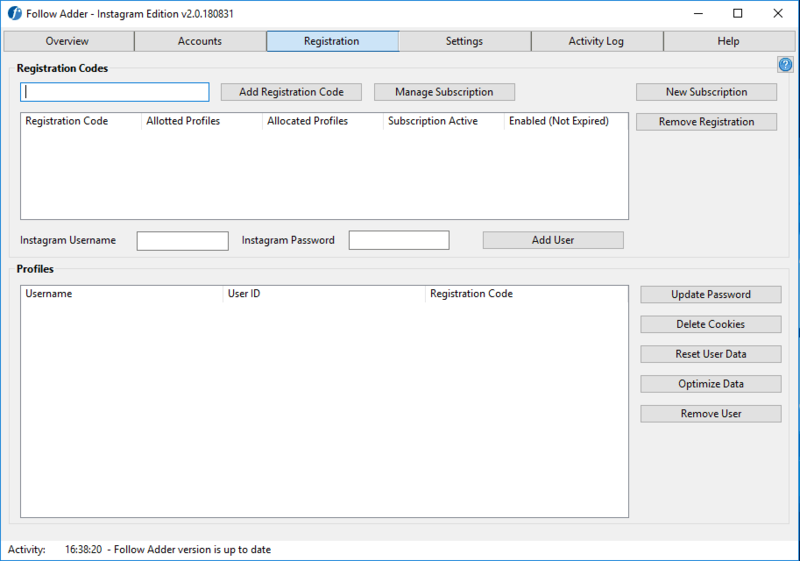 Add the login and password of your Instagram account to start working with it. Create a data list. 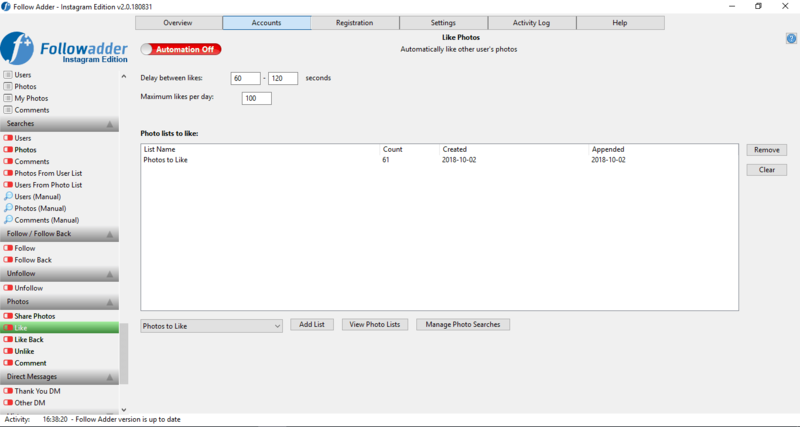 As mentioned earlier, you will be able to create the Users, Photos, My Photos, and Comments lists. To create any of them, go to the Accounts tab and select List section. For example, let’s create a list of users you want to follow. Give the list a name and click on the Create List button. 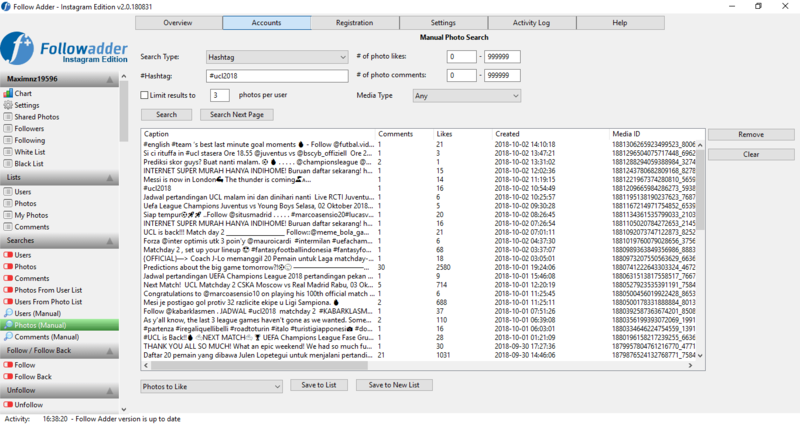 Go to Searches — Users (manual). Select hashtag as search type and enter the name of the hashtag you want to search for. Then click Search and save it under your searches list. To follow these users and go to the Follow/Follow Back section, choose the created list and click on Add list. Go to Users — enter the search name and hashtag — select the created list and click Add. Go to Lists — Photos — Create a list with some name — Photos (manual) — Select hashtag and add to list. Open Searches — Photo — enter the search name — select hashtag — choose the list you created. Go to Photos — Likes — select the created list — click Add List. After this, select the number of likes you want to be performed each day. Lists — Comments — Create a list — save the list. In this section, you can also write your own unique comment. I’m sure you will get a hang of it now. It isn’t difficult. 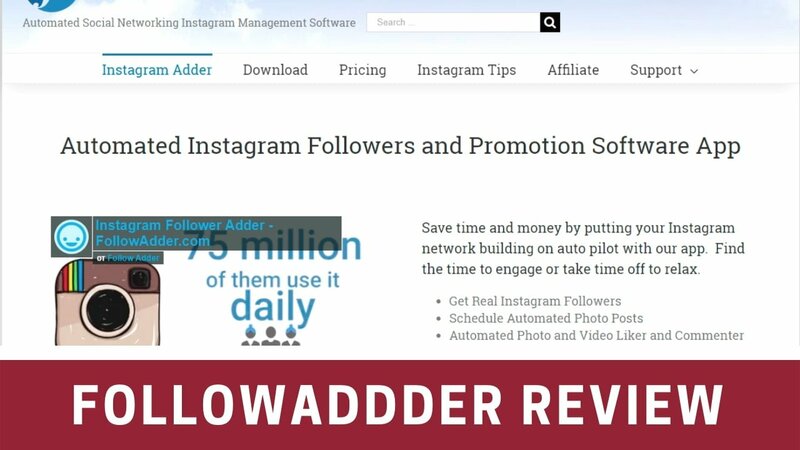 FollowAdder is the best tool to automate Instagram marketing and save a lot of time. Just try it once – we are sure you will like the software.